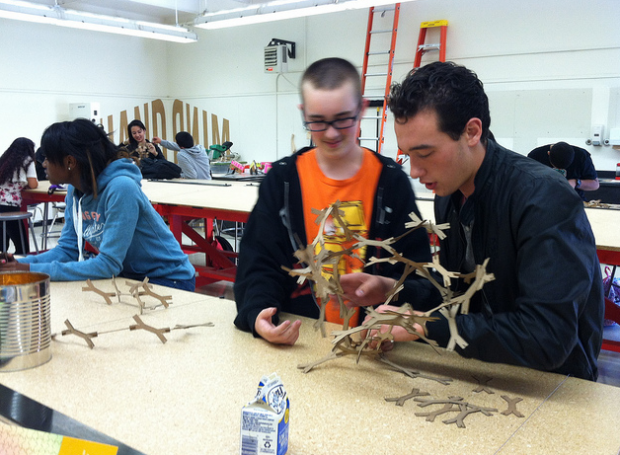 Studio H's design/build curriculum in Realm Charter School in Berkeley. Designers are privileged to work within a fascinating collision of fields at a time when the conversation could not be more pertinent. The intersection of design and education is ripe for exploration –– its metaphors, roles, spaces, and philosophies. These worlds have a lot to learn from one another. The design field covers the gamut of industries in art and science of making ideas, mindsets, and methodologies tangible. And the education world comprises a collection of formal and informal institutions focused on cultivating and refining skills and knowledge. In our ever-accelerating and complex world, the fields of education and design are a powerful combination. “The biggest thing that design gives students is this amazing sense of possibility...that everything and anything is possible." Bringing ideas to life is inherently empowering. And solving design problems with a community or team and seeing their immediate impact is that much more compelling. This simple and powerful act of creation is where we will begin our exploration recasting the role of students, teachers, parents, and education leaders as designers. In fact, the classroom is a strong platform on which to tap into the principles of design practice: what can the classroom learn from the studio, and maybe more importantly, what can education stakeholders––students, teachers, parents, activists, entrepreneurs –- learn from the role of the designer? How does recasting one’s role transform the way one approaches problems, teams, and one’s own practice? In this series, we will explore what it means to export various lenses of design in learning settings. From empowerment to empathy and iteration to co-creation–– how might we better illuminate this fertile intersection of design and learning? 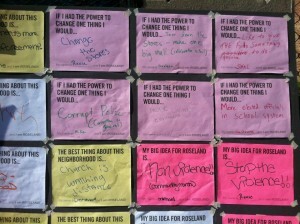 Students gather community ideas with Public Workshop in Chicago. Emily Pilloton and Matthew Miller, co-founders of Project H Design, launched Studio H, a "design/build" curriculum to spark student-driven community development through real-world projects in rural North Carolina and Berkeley, California. In the Bertie, North Carolina program, students designed and built parts of their own school and other important structures in the community. In Berkeley, Studio H is headquartered at and integrated into both the learning and community at Realm Charter School. “I started Project H out of a frustration with the design world and then serendipitously discovered that a lot of the things that I felt were lost in my own design practice could be really interesting inserted into a public education classroom,” she said. Pilloton, who gave a compelling TED talk about her work in North Carolina, said that in her experience working with youth both urban and rural, there is a common thread – the power of design to be a transformative personal learning experience. “The biggest thing that design gives students is this amazing sense of possibility," she said. "Especially at an age in high school when you're starting to feel bogged down––by family, college, friends, peer pressure, grades – you name it– it is a time when things feel heavy on your shoulders. Design opens different doors. We saw this in students in Bertie –- this wide-eyed look in seeing a chicken coop come to life, or being at the opening ceremony of a farmers’ market that they designed and built for their community –- there is this amazing sense that everything and anything is possible. Alex Gilliam of Public Workshop knows what it takes to be a "cheerleader of possibility" -- it's written in his mission statement. Public Workshop is empowering teens through design across the U.S. -- from its home base in Philadelphia to the Bronxto the neighborhoods of Chicago. This summer, Gilliam partnered with Demoiselle 2 Femme, a holistic young women’s empowerment program on Chicago’s South Side, to create a Community Design Leadership Boot Camp. A ‘doing’ camp, this design-build workshop focused on active learning, with the premise that young adults are strong agents of change in their community. After two weeks, countless community interviews and interventions, a spontaneous sidewalk fundraiser on a corner more known for drug deals than lemonade stands, and countless exchanges with curious passersby –– a whimsical, colorful playspace was born. "They develop a new swagger, but also a tenacity that they didn’t have. And that is priceless." In Gilliam’s and Pilloton’s work to activate teens, we discover that the magic of design in a learning setting is empowerment. “At the most basic level, when you are not specifically trying to churn out designers, [design thinking and design] is really about empowerment,” Gilliam said. Empowerment emanates from the dynamic pairing of possibility and agency, ownership and impact, and the right tools and critical thought to make it all happen. This process of seeing possibility and acting upon it is a central concept in critical and engaged pedagogy. It is easy to get excited about the novelty of design and designers in an education setting. But in many ways, the intersection of design and learning is more natural than novel. It illuminates the innately empowering and democratic power that is true learning. In a time when critical and constructive educational theories are threatened, our attention to design thinking in the classroom is crucial. Melanie Kahl is a learning and design strategist with The Third Teacher+ team, a learning design consultancy at Cannon Design. She also acts as a communication architect, experience designer, and organizational and policy specialist. Melanie is particularly interested in the ways in which the design of learning programs and places can act as a catalyst for community development. Her writing has appeared in FastCo Design, American School & University, and The Creativity Post. Update 10/2/12: The current version reflects the correct attribution of quotes to sources.